What&#146;s old is new again. First Run Features brings back a minor classic in the remastered DVD version of A Tickle in the Heart. Filmed in moody black-and-white and not so much scripted or scored, as quilted together from odd scraps and patches, German/Swiss film director Stefan Schwierert&#146;s documentary unfolds the now nearly century-long story of the Epstein brothers &#150; Max, Julie, and Willie &#150; the once and future kings of klezmer music. 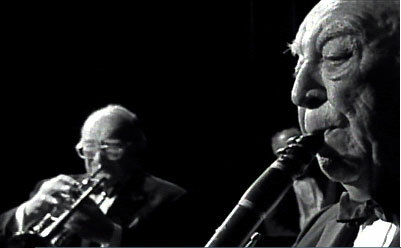 The film opens with an interview and performance clips, as if to suggest a documentary on the folk roots of jazz music. Interview footage of the brothers in their homes in south Florida, preparing to give a concert at the local retirement community center mixes humorous, intimate family scenes with ominous, cloud-filled south Florida skies (in the cinematographic style of David Lynch&#146;s Eraserhead)&#151;the juxtaposition hints of classic film noir, Reifenstahl&#146;s Triumph of the Will, old news footage of Florida hurricanes, the Brooklyn streets of The Pawnbroker. Similar visual collage and atmosphere-inducing effects waft like cigarette smoke through later Berlin and Polish country village scenes. Klezmer music is perhaps familiar to most Americans through its Broadway-inflected interpretation, Fiddler on the Roof. Among the sounds of klezmer &#150; sad, festive, rude, tender, raucous &#150; the most recognizable may be the mournful wailing, the quick turns from sadness to exuberance, the rapid-fire runs of notes like a flock of birds taking wing, and nostalgic, at times maudlin lyrics. This was the traditional instrumental music of Ashkenazi European Jewry and shares roots with Romani (gypsy), Polish, Hungarian, Ukrainian, and other East European folk music traditions. Yiddish was the lingua franca of European Jewry, a transnational folk culture which kept cultural traditions alive during long, dark periods of history. As Schwietert documents, klezmer music and the culture to which it gave voice have led a monumental, nomadic, transformative life. A Tickle in the Heart opens in the bungalow retirement communities of south Florida and follows the Eptsein brothers&#146; lives in retirement, where they play for the same audiences who had followed them in their youth. The film&#146;s narrative takes the viewer to the streets of Brooklyn and New Jersey, to the orthodox Jewish communities of today and the immigrant communities of one, two, three generations ago. The brothers descended from turn-of-the-century Polish and Russian Jewish immigrants to Brooklyn. Brother Max became one of the stars of the younger klezmer music generation of the burgeoning borscht belt circuit (the Catskill Mountain resorts) following the First World War and the Epstein brothers would go on to have a long and successful career for as long as Yiddish culture continued to flourish, well into the 1960s. In the 1990s the Epstein brothers are invited to play a concert in Berlin. Surprised to find klezmer music so popular at a &#147;klezmer revival&#148; concert in post-fall Berlin, the brothers tease their middle-class German audience (well-versed in and great fans of all sorts of folk music traditions) into sing-along, one of the subtle, but profound moments of this film. The Epsteins use the opportunity to make a would-be nostalgic visit to a Polish village where some of their ancestors had once lived. Amidst the mutual incomprehension of Polish Yiddish, German, and English, they find a common memory playing klezmer tunes to gathered local old folks, and the viewer sees dim memories&#151;happy memories, safely happy ones– reawaken within them. The film, the music, and the brothers offer stark contrasts in a world that, while full of difficulties, is also highly romantic. Like dreamers from a bittersweet 1930s musical, they hail from a world long dead and now overgrown with nostalgic longing for a past that never existed. Ironic, too, that A Tickle in the Heart is a German production, funded by the German government which has had great respect forartistic and documentary film-making, and by a nation which today has great respect and fascination for a culture driven from their land by a generation now fading and soon to pass from direct historical memory. So, too, the Epstein brothers and their world are now replaced by a time and culture where mainstream cultural assimilation has led to the death of Yiddish-speaking subculture, where government support for &#147;serious&#148; art and documentary funding has been abolished, and where Max and Willie and Julie take their last bows and fade. As one member of the production team said, &#147;When it comes to ethnic or folk music, there&#146;s just a difference between the folks who lived the life of the music, versus the people who adopted it later.&#148; This film helps identify the Epstein brothers as among the last seminal musicians in the great flowering of Yiddish culture in the nineteenth and twentieth centuries. A particular joy of A Tickle in the Heart is that it will live on as a bridge between those generations and those worlds.